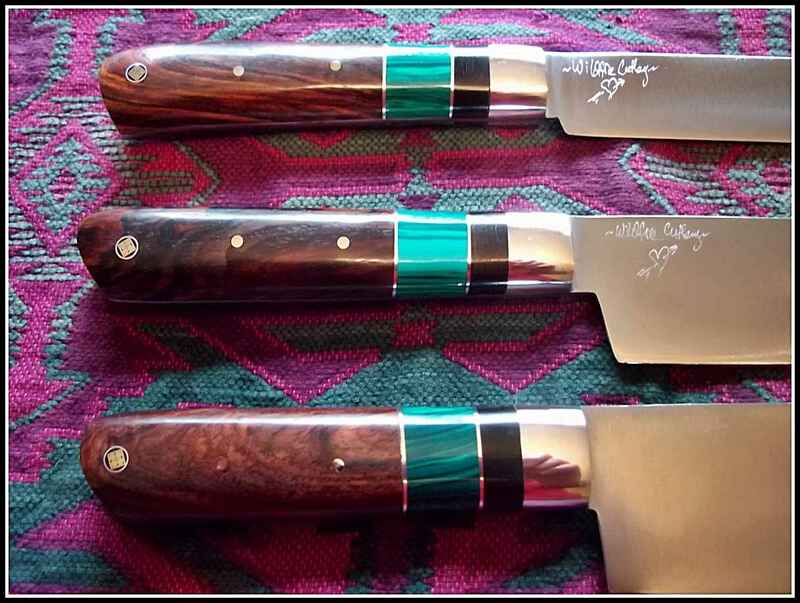 Options & costs to fancy up your kitchen knife handle by your own design. Easy way to approach this is look at photos for ideas. 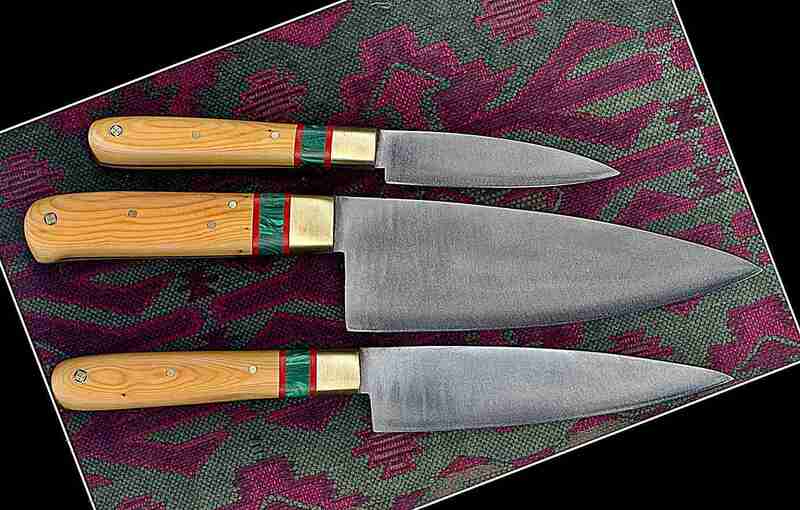 A bolster is between the blade and the handle wood and protects the handle wood from absorbing water from the end grain of the handle wood. Water will be soaked up like a sponge without protection. 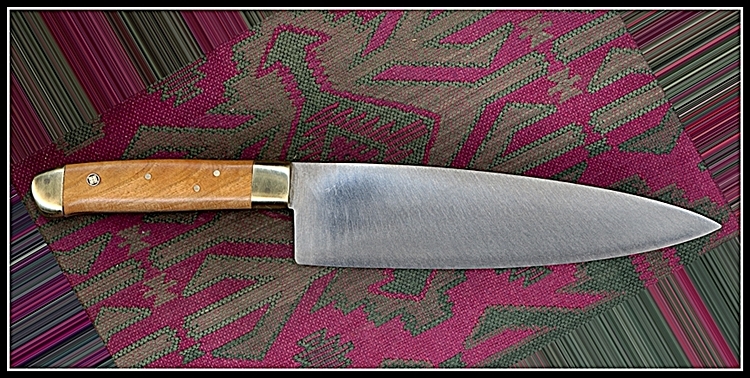 I use metal – brass, copper, stainless. 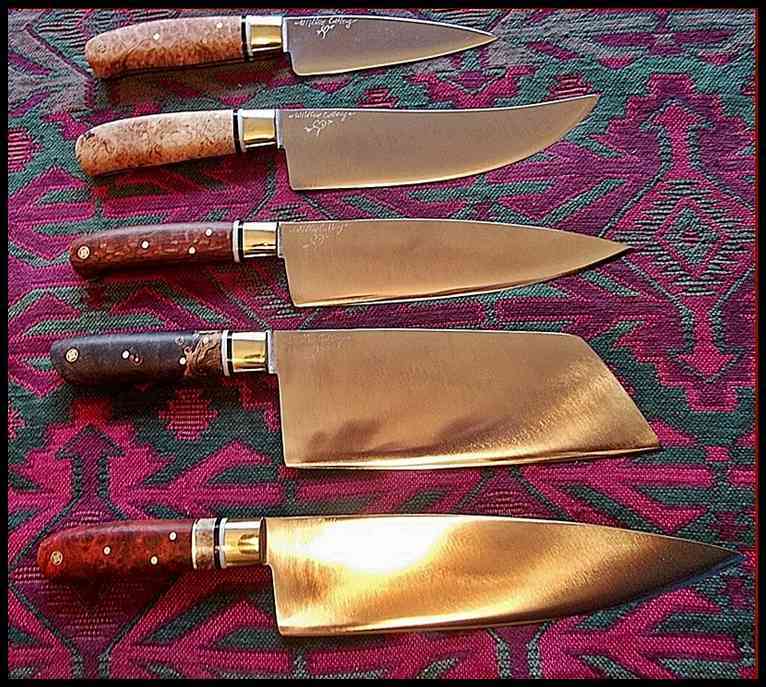 I use either brass or copper bolsters (3/4″ x 3/8″) , which are pinned/rivets and glued onto the blade steel. Single brass bolsters – ⇒ cost included in prices on price list. 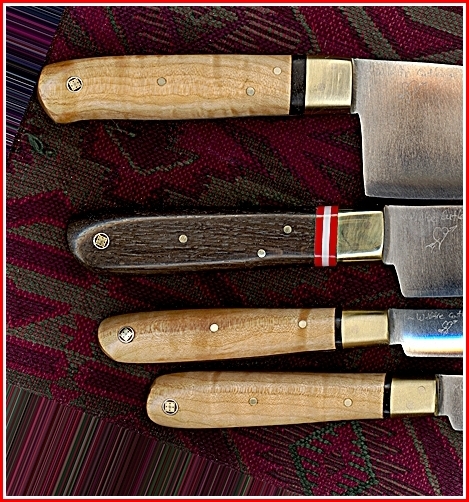 ⇐Left: click to enlarge – one example of bolster spacers. 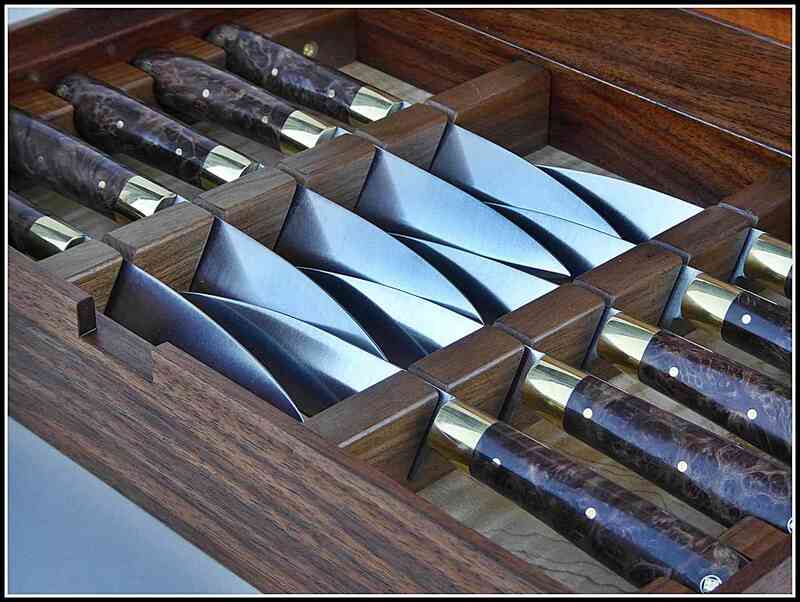 Bolster spacers are between the brass bolsters and the wood. I stock 2 thicknesses of bolster material – 1/8″ and .031 thick along with various thicknesses of stabilized burled hard wood. 1/8″ bolster spacers come in red, black and white. .031 vulcanized spacer materials come in red, black, white and green. green/red/green triple bolster spacer add-on, .031″ thick. 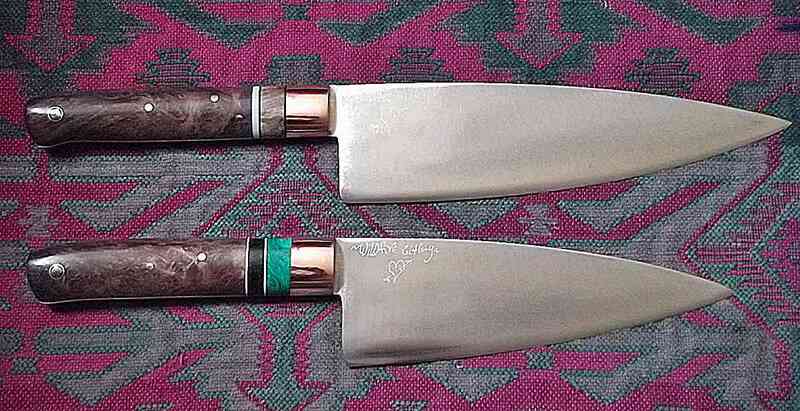 If you want stabilized wood, I now offer stabilized Redwood for $20.00 per knife, to ordering clients. This charge covers cost of shipping and stabilizing my Redwood at a company in Arizona that does this. I consider Redwood a dark wood. If you want a different stabilized dark wood, or a light wood then tell me and I can send you some sensible options. There is a charge if I need to deal with ‘out of the shop wood’. 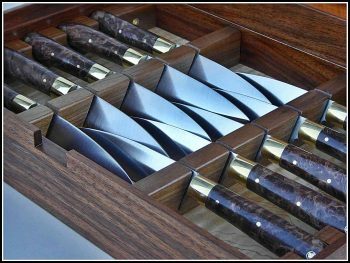 Extra cost to you for using of of the shop wood is $20, plus the full cost of the stabilized wood you choose and shipping cost to me. 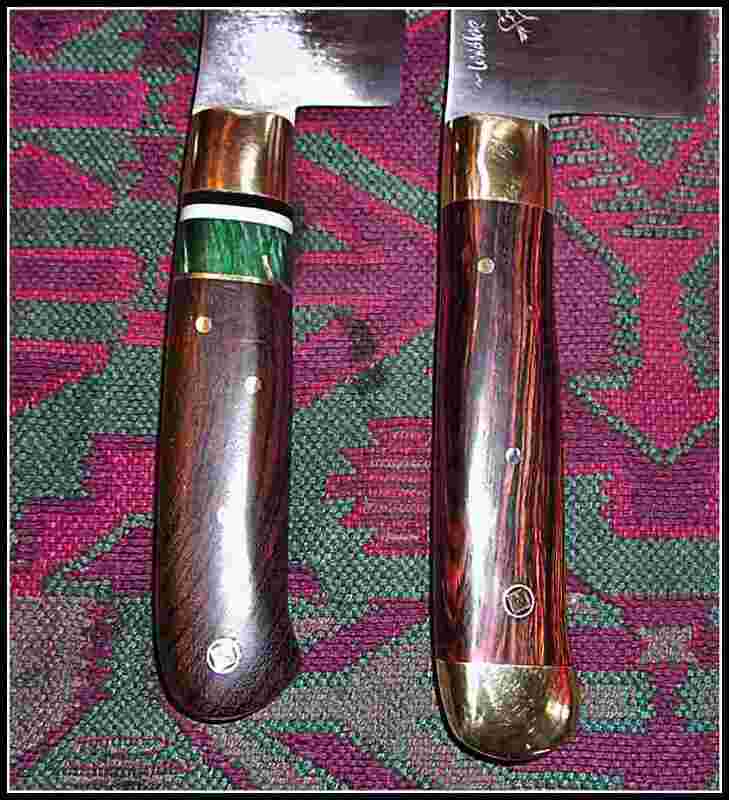 See photo below (click to enlarge) of Steak knife Set w/ stabilized Redwood handles. Bed spacers (see 2nd slide at the top) are strictly .031 thick only. if they exist. Just ask and we can see if I can order it. Bottom left – Red/white bed spacers. White bolster spacer, copper bolsters. 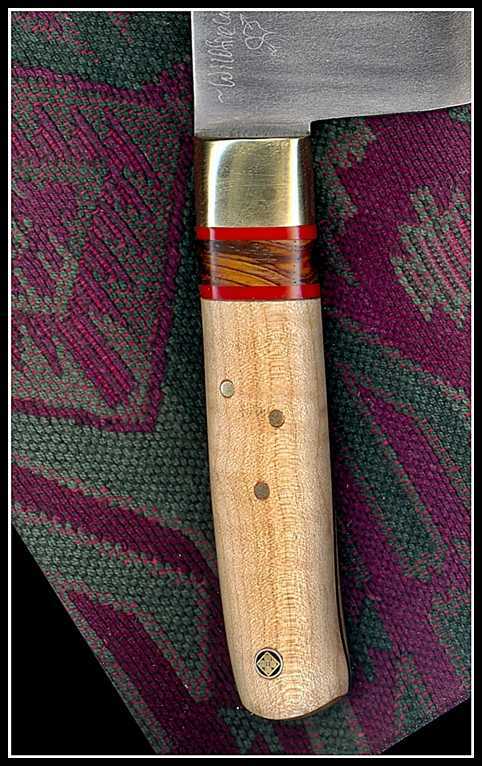 Below right – Bed spacer, .031 black/white array with Yew wood & there is also Cocobolo and nickel silver bolster spacers.